The energy executives shuffled into the cramped Westminster room like chastened school children. After Scottish Power uncorked a record 19% increase to gas last month, the company and its competitors were called in for a ritual flogging. The MPs didn?t hold back. ?Have you anything else ghastly up your sleeve?? barked Tim Yeo, the Conservative chairman of the Commons energy and climate change committee. They did. A few weeks later British Gas blamed the soaring price of wholesale gas for its own 18% increase. The hikes provided a timely backdrop for Chris Huhne. The energy secretary last week unveiled his long-awaited energy white paper, a L110 billion plan to replace Britain?s fossil-fuelled power stations with wind turbines and nuclear reactors. Quiet and clean will replace old and dirty. The system of subsidies he introduced, which companies said would finance the more expensive stations, represented the biggest shake-up of the energy market since privatisation two decades ago. Huhne admitted that we?d all have to share the pain. But he was quick to add that it will still be the ?the cheapest, cleanest way of keeping the lights on?. Except it won?t be. Mark Powell at KPMG is one of a chorus of industry figures calling for an urgent rethink of the government?s plans. ?At a time when we are shutting schools, swimming pools, public services, can we hand on heart say ?this is the most economic way of going about this.? I don?t think we can. The world has changed.? His impending report, Rethinking the Unaffordable, lays out what he said is the problem. We have signed up to two separate, legally binding targets. One to cut carbon dioxide emissions by 34% by 2020, the other to source at least 15% of total energy ? including transport ? from renewable sources by the same year. The electricity industry will bear the brunt of the shift. Today it produces just 7% from renewable sources but will have to increase that nearly sixfold if we are to reach our goal. Somewhere along the way the paths towards those two targets were fused under one policy. And that?s the problem. ?These are two very different things,? Powell said. ?The government won the argument on the need to reduce carbon emissions, but the concepts of ?low carbon? and ?renewable energy? have been conflated. You could potentially hit the carbon target with significantly lower renewable resources.? A new fleet of cleaner gas-fired power stations, some wind and other low-carbon alternatives would probably do the trick, he said. It certainly wouldn?t require the radical overhaul envisaged under the renewables plan. The difference means tens of billions in potential savings. A so-called combine cycle gas turbine station, for example, is a fraction of the price of a nuclear reactor and can be built in a couple of years, rather than nearly a decade. The government is nonetheless launching headlong into the most ambitious industrial makeover in the world to meet the renewables goal. The theoretical costs, which have been talked about for years as a far-off eventuality, are now upon us. Michael Pollitt of Cambridge university?s electricity policy research group said: ?Here is where you start paying for political aspirations, which so far have been notional targets. The question that the government needs to ask itself is whether UK domestic decarbonisation is worth the cost when a global agreement [on emissions] looks farther away than ever.? For politicians that is a worry. Soaring living costs don?t win votes. Last week the Department of Energy revealed that rising bills have pushed 5.5m households into fuel poverty ? a fifth of British homes. 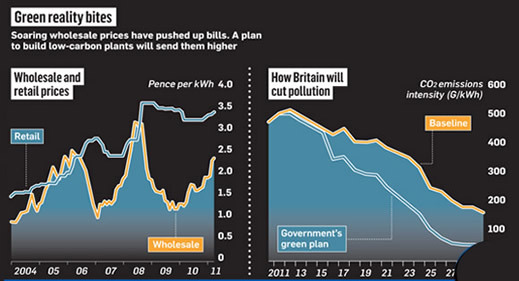 Not surprisingly, Huhne predicted our green conversion means power prices will rise, but only by a very manageable £160 by 2030. Centrica?s price rises this month added nearly £200 to average bills in one go. Industry sources say the estimate is laughably low for two reasons. Huhne said it will cost L110 billion to fund the makeover. That does not include the tens of billions to be invested in gas production and infrastructure. It is, in other words, just one half of the equation. Energy executives say the more representative figure for the industry as a whole is about £200 billion. Whatever the number ends up being, we?ll pay for it through our bills. Some say that the plan is fatally flawed at any price. If we take the £110 billion figure, that still equates to an average investment by the big six utilities of about £12 billion a year over the next decade. Last year the industry spent just £3 billion on new plants and infrastructure. Meanwhile, one of the big six utilities, Npower, has been put up for sale by its indebted parent RWE. Its rival Eon is also wobbling under a mountain of debt. Neither is in the position to fork out billions. The government argued, however, that the measures should be enough to jumpstart new projects. The energy department said: ?The whole purpose of our reforms is to bring on the investment we need in Britain and make this country a magnet for low carbon investment.? The white paper was still very light on the details the industry is clamouring for. Before a company pushes the button on a L5 billion atomic power station, knowing the exact level of support the government is willing to guarantee is vital. Andrew Horstead of Utilyx, the consultancy, said: ?You?ve got to question whether the government truly understands the mechanics of the market. We?ve been waiting for 12 months for this piece of work and what we?ve got is another round of consultations.? As far as Powell is concerned, that is no bad thing. ?We started this journey based on pre-recession assumptions. It?s not too late ? it?s imperative ? for a real debate about whether the current policy is the correct one for the UK. ?